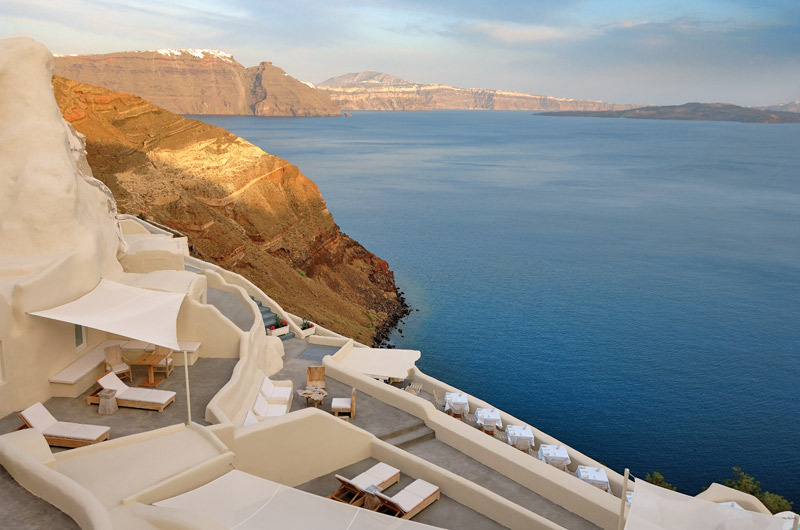 Mystique Hotel is situated on Oia's famous cliffs, the stylish Mystique features dazzling views of clear blue equatorial waters, the volcano, and the Aegean Caldera. Surrounded by some of the world’s most beautiful scenery, our resort’s island-style design pays homage to nature in a climate of unabashed luxury. Eighteen suites and villas in a landscape of more than 2000 square meters provide a sensorial experience of Santorini in surroundings of understated elegance. Mystique is a brand new hotel, opening On the 15th of May 2007, and is already member of the Luxury Collection of Starwood Hotels. Mystique Vibrant Suites: 30-40 sq.m, Spacious bedroom with king-size bed and adjoining living space, large panoramic private terrace with open-air dinning area, great views to the sea and the Caldera, airy bathroom featuring hydro massage bathtub with shower. Mystique Allure Suites: 40-50 sq.m, Spacious bedroom with king-size bed and separate living room, large panoramic private terrace with open-air dinning area, great views to the sea and the Caldera, airy bathroom featuring Jacuzzi bathtub and shower. Mystique Spiritual Suites & Spa: 50-60 sq.m, Spacious bedroom with king-size bed, separate living room, spa room including Jacuzzi, treadmill, bicycle, fitness machine, spa bed, large panoramic private terrace with open-air dinning area, great views to the sea and the Caldera, airy bathroom featuring shower and steam bath. Mystique Air of Secrecy Villa: 70 sq.m, Independent villa with spacious bedroom with king-size bed, walk-in wardrobe, separate large living room, large panoramic private terrace with open- air dinning area, great views to the sea and the Caldera, airy bathroom featuring Jacuzzi bathtub, shower and steam bath. Air of Mystery Villa: 70 sq.m, Independent villa with spacious bedroom with king-size bed, walk-in wardrobe, separate large living room, large panoramic private terrace with open- air dinning area, great views to the sea and the Caldera, airy bathroom featuring Jacuzzi bathtub, shower and steam bath. All suites and villas open onto sea-facing terraces/balconies with a relaxing daybed. Guests of Mystique luxury Hotel may experience an outdoor infinity-edge pool, the “Aura” Pool Bar, the Charisma Gourmet Restaurant and the “Secret” Wine Cave. All accommodation is lovingly handcrafted from wood, local stone and glass. Cushions of antique textiles. Plump luxurious towels. Enticing patterns carved into the walls. Slatted wooden decks that lead to the plunge pool surrounded by sun beds for the utmost relaxation. -Due to the particular construction of the hotel (on the cliff), children under the age of 14 years old are not accepted for safety reasons. -Free Wi-Fi access in all suites and public areas. -Free entrance to Vedema Resort's fitness center with Cybex equipment and free use of open-air Jacuzzi, sauna, steam bath.